These next few posts cover the basic components of a world generated by LoreGen. This article covers how to configure the LoreGen engine and change the rules and data it uses to generate worlds. If you want to jump straight to learning about the composition of a LoreGen-built world, you can skip to the next post. The basic LoreGen settings can be set in its configuration file. Whenever LoreGen runs, it reads “loregen.config” in the root directory of the executable. In the configuration file (see the screenshot), the first line notes the version of LoreGen, which there’s no reason to mess with. The second line sets the folder that LoreGen will read data and settings from when it constructs a world. Simply change “Default” to the name of whatever folder you want the program to read from. 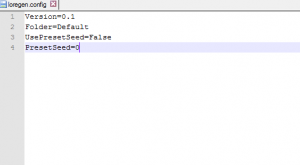 The other items of relevance in the configuration file are the settings for the randomization seed. If a preset seed is used, the program will use the same seed for randomization every time the program runs, meaning the same world will be generated. You can also set the preset seed used; if the previous line is set to “false,” then this line has no effect. If a preset seed is not used, a seed is pseudorandomly determined every time the program runs. When LoreGen runs, it uses rules and data defined in external CSV and text files. (CSV stands for “comma-separated values,” which is a very simple file format that can be read by spreadsheet programs and basic text editors.) I’m considering someday changing the data so it’s stored in something more flexible like XML or JSON, but for now the simplicity of CSV works. The LoreGen Worldbuilder comes with two folders of data: “RawData” and “Default.” Unless configured otherwise, the program reads from the “Default” folder; the “RawData” folder is included as a backup, so don’t change anything in there. Insider the folder, there is a “README” text file. This contains descriptions and formatting info about the various data files used by LoreGen. Future posts will go into detail about what each of these files does, but you can start by peeking at “WorldRules.csv,” which contains rules used when during world generation. Starting next post, I’ll talk about how some of the information from that file is used when LoreGen creates worlds. The next post introduces the world map.